Members of SYNAPA Union at Kamenge Neuropsychiatric Center have begun a three-day strike this 21 February. Mental patients say they fall victim of the situation. A group of SYNAPA/CNPK union members on strike. 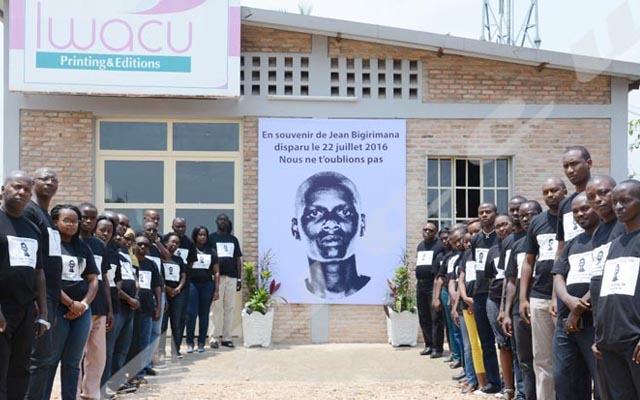 In the morning of this Wednesday at Kamenge Neuropsychiatric Center- CNPK, the only center which treats mental patients in Burundi located in the north of the capital Bujumbura, one could see a group of nurses in uniform. A little ahead, there was another group of people, some of them looking desperate, others with angry faces speaking aloud as though they were quarrelling with somebody. They were mental patients and parents of mentally ill kids. Patients looked hopeless when they learnt that the medical staff would not receive them as always because they were on strike. “I am suffering from mental disorder. I rod for 48 hours coming to get other medicines as the ones I had were finished. I came here early in the morning and queued up hoping to be given medicines but I later on learnt that I wouldn’t be helped as nurses were on strike” said André, a mental patient met at the CNPK. Some people fear for their patient’s health. “My child is an epileptic. I came to check his current health situation. The medical staff was supposed to decide whether or not he would go on with medication. Now that they didn’t receive me, I am afraid his disease could start over again,” said a parent met at CNPK. Another great problem is that most of the patients met on the spot have said they cannot afford to buy their medicines in private pharmacies because they are very expensive. Adolphe Niyongere, the representative of members of SYNAPA union at CNPK, accuses the CNPK representative of ignoring their pleas. “We have issued a warning notice but the center’s representative did not initiate the dialogue. We have no other option. We are obliged to go on strike despite the impact this may still have on patients’ health,” he said. Appolyte Manirakiza, CNPK director, says those nurses have no reason to go on strike. He says that all the reasons advanced in their notice are unfounded. He reminds them that the patients’ health is their responsibility. The members of SYNAPA Union at CNPK advance three main reasons that pushed them to stage a strike namely the attitude of CNPK director to deny unionists to hold assemblies inside CNPK, the non-awarding of bonus on the basis of performance and the non-functioning of the permanent social dialogue framework.